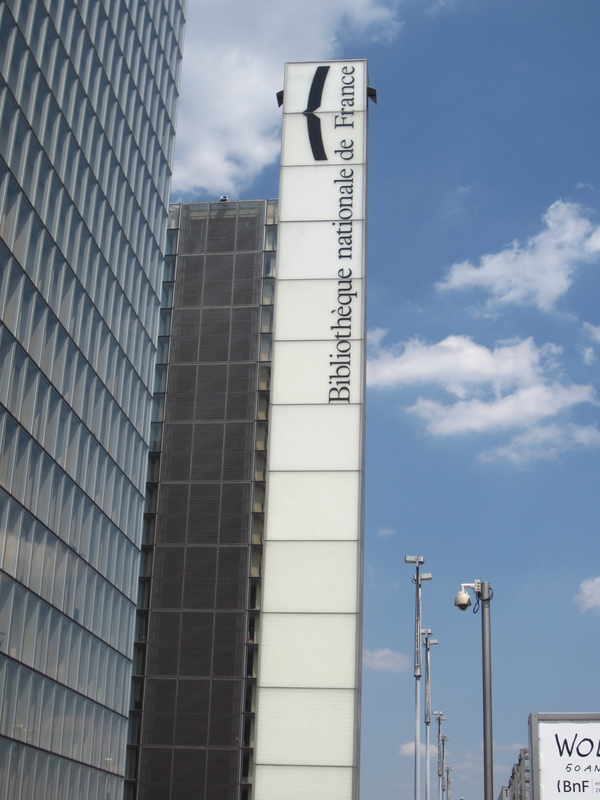 To get to the François Mitterrand site, take Line 14 on the Metro toward Olympiads. 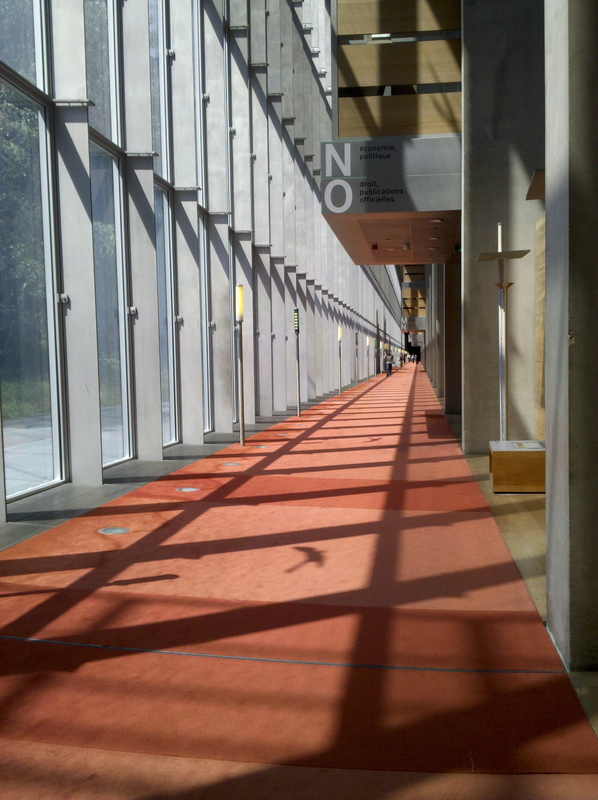 Get off and follow the signs toward the Bibliothèque. When you get to street level, cross the street toward the Frog and British Library Pub. Continue on past Rue Emile Durkheim, and turn right at the MK2 Theater. Walk past the theater and follow the signs to the East entrance. There’s a security guard at the entrance who will check through your bags. After you walk through the electronic scanner, turn left and turn left at the first hallway to register for your reader’s card. You’ll first pick up a queue number at the desk. When it’s your turn, make sure you have your passport, a letter from your adviser (in French) with your project title, and student ID. Check the website if you are a professor or independent scholar to determine what other documents you need to present. After you receive your reader’s card, go to the cashier in front of the security check at the East entrance to pay for it. 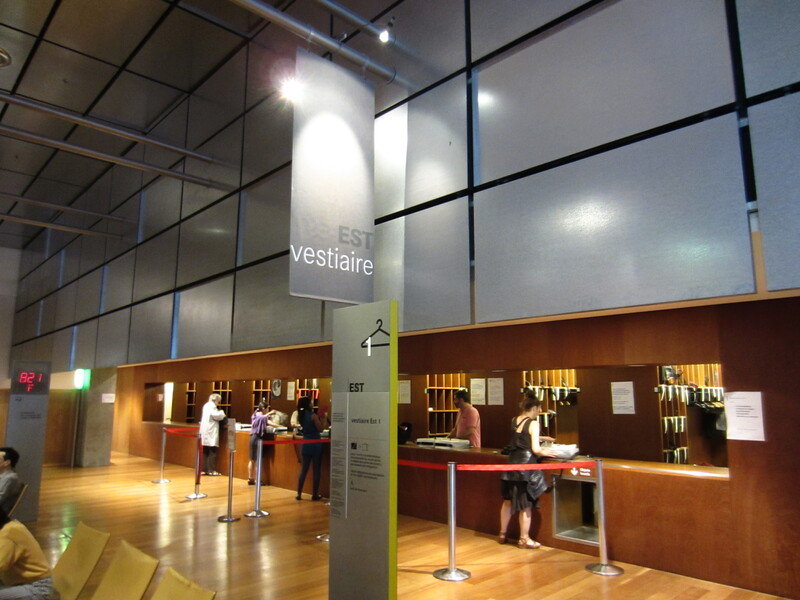 You can then bring your personal belongings to the vestiaire, where you’ll pick up a clear plastic case for whatever you would like to bring into the reading rooms. 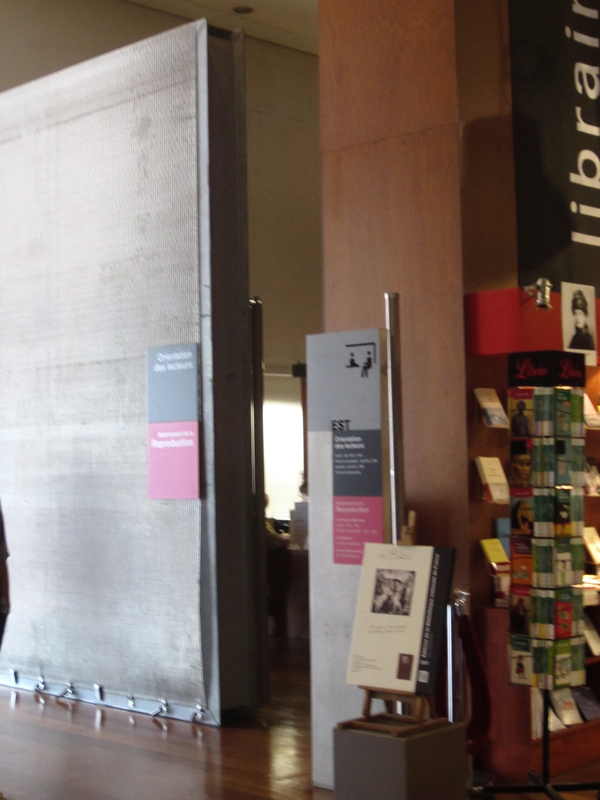 You will also receive a numbered ticket to pick up your bag when you return from the reading room. Finally, you can use the computer station near the vestiaire to reserve a seat in one of the reading rooms. Once you have a seat, then you will be allowed to pass through the doors to your left by scanning your reader’s card on the electronic scanner by the door. 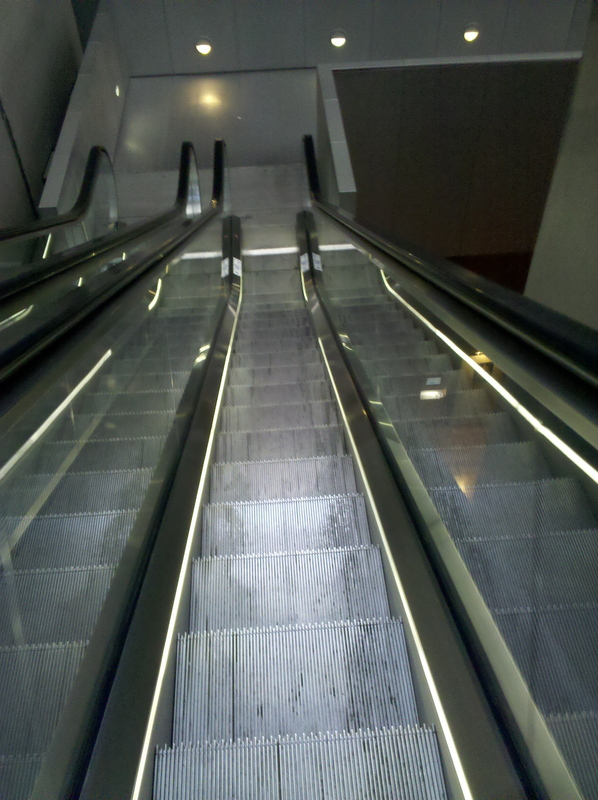 Go down two escalators, scan your card again, and then you’re free to find your reading room and seat. Use the online catalog to find and request your materials. They should arrive within an hour. You can monitor the progress of your requests through the same system. There are ethernet cables provided in the reading rooms. Occasionally, you may need to share with the person across from you. While you wait, there a number of secondary sources available on the shelves. Once you have your reader’s card. 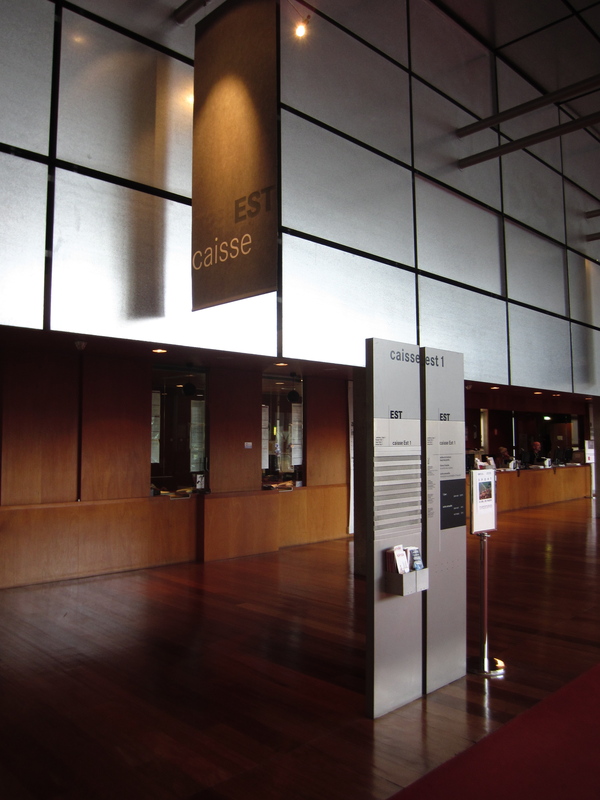 You can reserve a seat and materials online through “Espace Personnel“even before arriving at the archives. In general, here are the hours. Check the link above for more details and for hours for other sites. There is a café on the Rez de Jardin reading level (where you’ll be), so you don’t need to leave the archives. You can also bring a meal and snacks in with you. If you want to eat elsewhere, you will need to return your materials before leaving and use the computers at the lower level by the information desk to retain your seat. They will only hold it for up to two hours. There are only a few restaurants nearby: The Frog and British Library Pub and EXKi – a great cafe with organic ready-to-eat meals, but a little pricey. Send me a message if you discover any others that you can recommend! Next Post What is “civilization”?